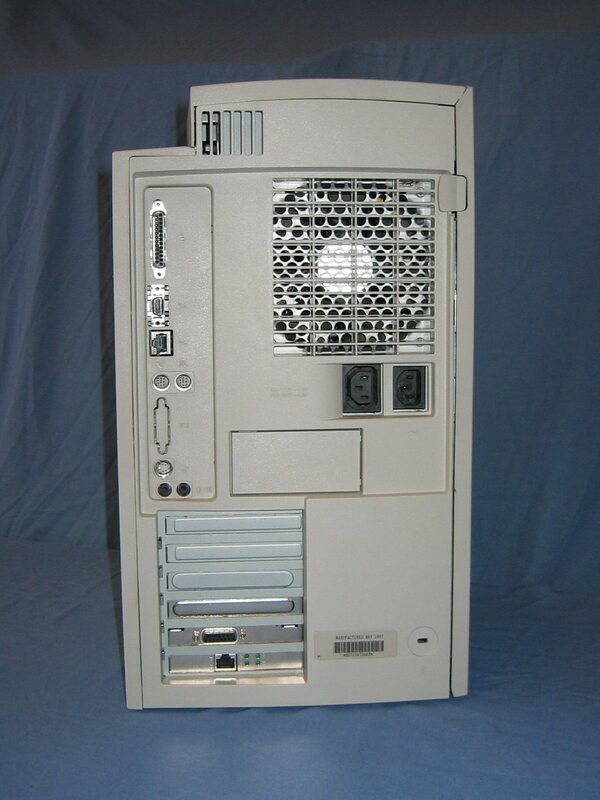 This 9600/200 system was obtained through eBay in December 2004. 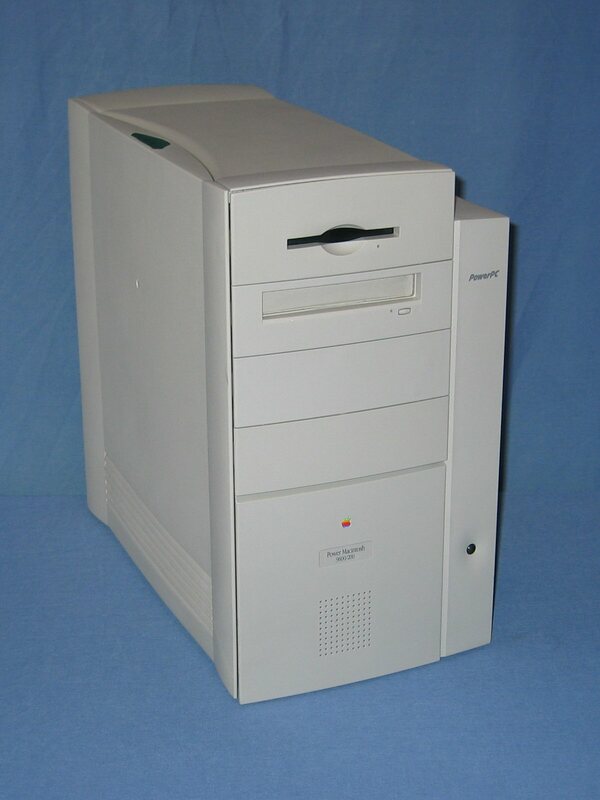 It is a stock system running MacOS 9.1 and has an additional 10/100 Ethernet card. The front of the unit. 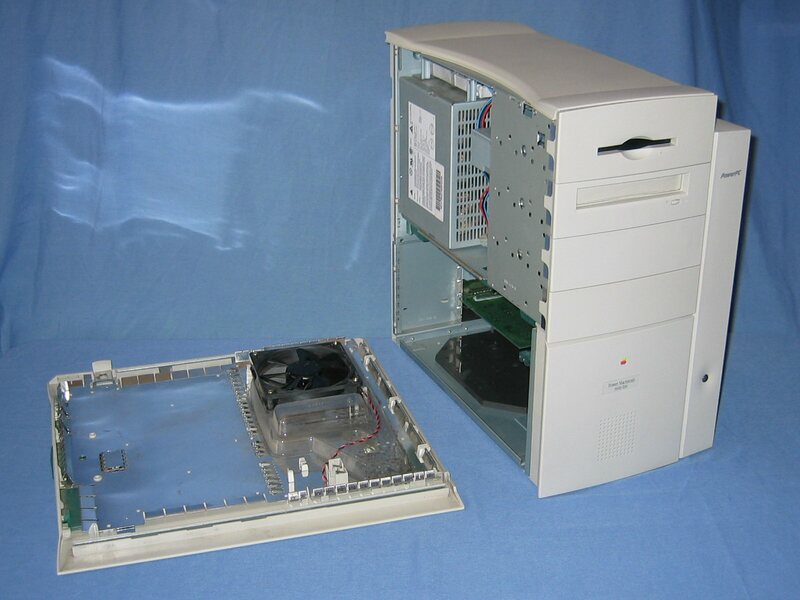 Below the CD-ROM drive are two more drive bays, for which exists bezels for a tape drive (an option on the Workgroup Server 9650) or a zip drive (the version for the 8/9600 was a simple rectangular cutout). The rear of the unit. The presence of a blocked out display port in the port area is due to this case design being shared with the 8600 which does come with onboard video. Hidden behind a rectangular piece of plastic are the ports for the AV module which is not supported by the 9600, only the 8600. After depressing the button at the top of the side panel it comes away from the case. It is interesting to see the well thought out connection for the 120mm fan that is mounted on the side panel. After removing the side panel the PCI cards and drives are accessible. 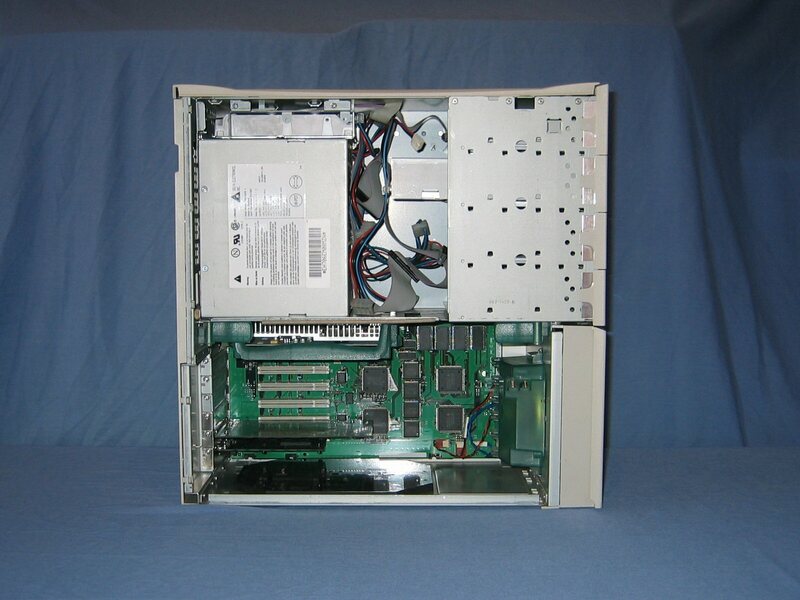 The boot SCSI hard drive is mounted above the power supply with room for two more 5.25" or 3.5" drives below the CD-ROM. The black plastic piece on the floor of the case provides the facility for two 3.5" drives or one 5.25" drive. 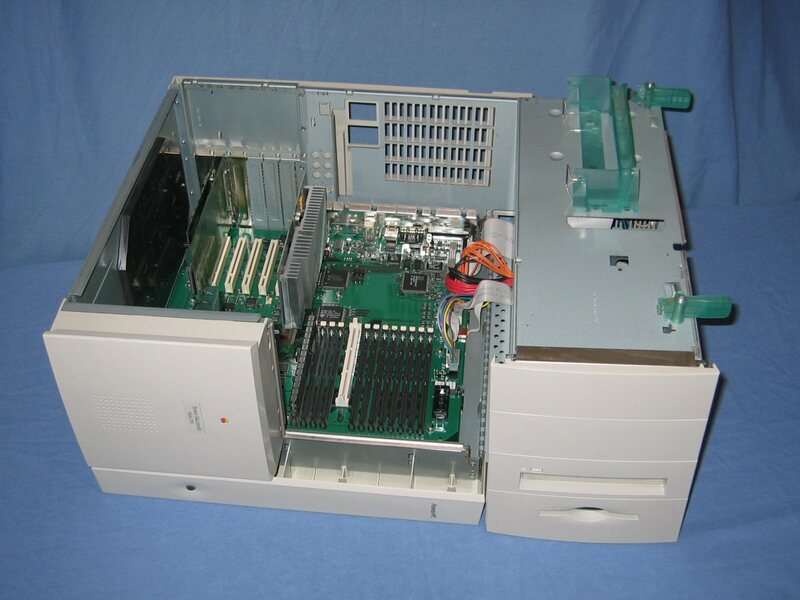 After releasing the two green plastic latches the enitre top assembly containing the power supply and drives simply folds out to provide access to the RAM slots and processor card. The logic board takes up almost all of the available space. 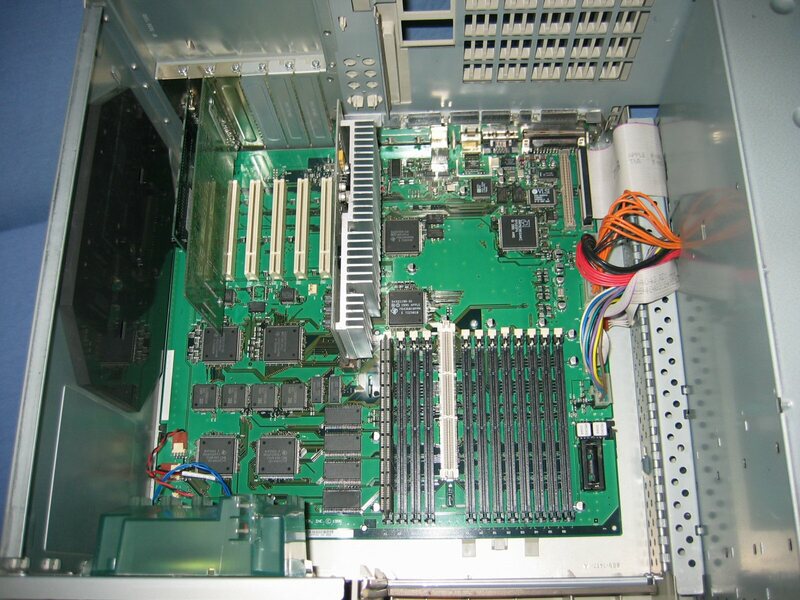 Of the ten RAM slots only one is populated, with a 64MB DIMM.